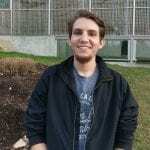 Andrew Dunaway is a student working towards his master’s degree at the University of Kentucky and hopes to one day be an animal nutritionist for a zoo or sanctuary so that he may help enrich the lives of animals through healthy food. Andrew is a resident of Lexington, and he enjoys music and singing, trivia night, and spending time with friends. He joined the On-Site Volunteer team in January 2017 and really enjoys learning more about the sanctuary residents and creating enrichment.